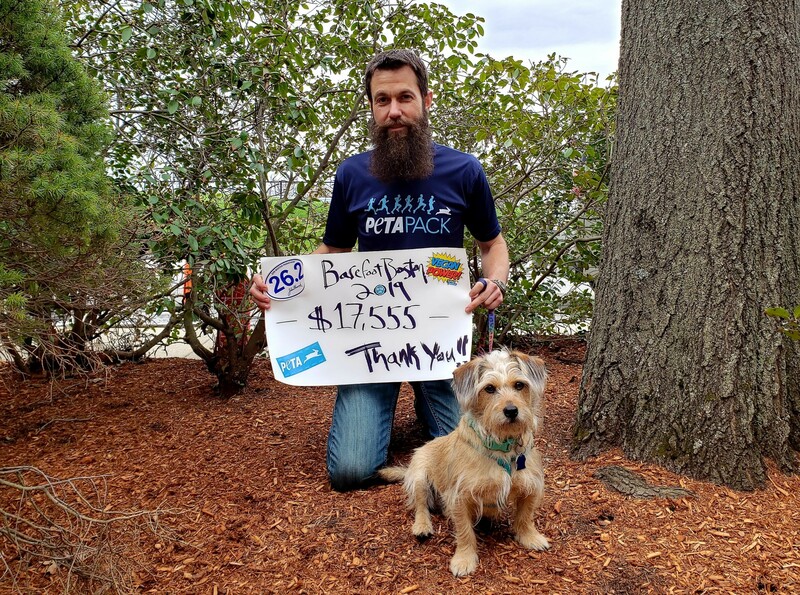 What began with a goal of raising $5,000 to support PETA’s vital work for animals turned raising more $17,500! Another Boston Marathon has passed and what a great one it was! The day started at 6:30 AM with thunder, lightning and windswept rain as all of us runners waited to board the bus to the start line. I had flashbacks of the notorious cold & rainy marathon of the previous year! But the skies eventually cleared for the start, and we had perfect conditions all day. I finished this barefoot marathon in 3 hours, 25 minutes and 25 seconds. After a bit of rest, my feet are beginning to look and feel normal again. So much crowd support out on the course, including a bunch of “Go PETA!” shout-outs and almost as many "Nice beard... where's your shoes?!?" 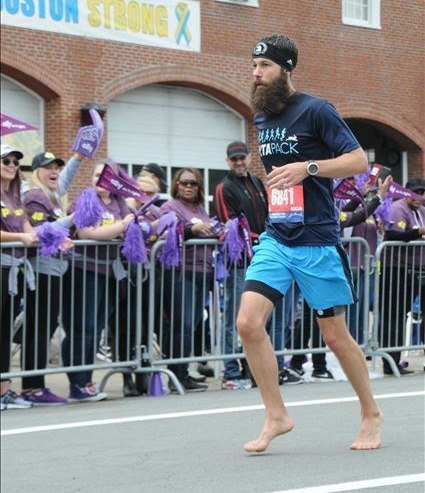 I’m glad I got to wave to a few of you during my barefoot journey from Hopkinton to Boston! Thanks to everyone that donated, promoted or otherwise shared enthusiasm for this very special fundraiser. We had a lot of momentum this year which really inspired my training all winter long. Donation goals and marathon finish times are all worthy ambitions, but in the end, what’s most important to me is that these funds will help so many animals. The fact that I can run for PETA in one of the world’s greatest marathons, AND bring an animal rights message to the race in my own small way is a true honor for me. Thank you all once again… and perhaps we go even bigger in 2020!?!? 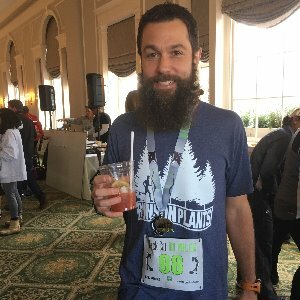 To those of you visiting my PETA Pack page for the first time, in April of 2019 I ran the Boston Marathon - barefoot! For the 2nd year in a row, I used this extreme challenge to support PETA's amazing "Backyard Dogs" program. When a guardian refuses to let their dog live indoors, these animals must cope with the extreme cold, or the extreme heat. In the words of one PETA volunteer, they just "...watch as life passes them by, deprived of companionship, exercise and respect." Thanks to PETA, many formerly hopeless dogs have been given sturdy new doghouses as well as much needed attention and affection. Watch PETA's team in action. Thanks! Make a donation to Scott DeFusco.